Amigurumi Balloons is an original crochet pattern by June Gilbank. What better way to celebrate than with a bunch of balloons? Made in pastels like these, they’d be perfect for baby shower decorations or for Easter. Made in bolder colours, they’d brighten any occasion! 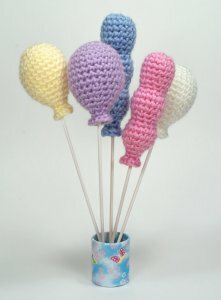 I've created 2 different amigurumi balloon patterns for you: the standard round balloon, and the extra-fun long balloon. Each balloon only take a few minutes to crochet, so you can whip up a bunch in no time! Date Added: 05/31/2012 by Monica B. Date Added: 08/16/2010 by Erica K.
so cute! they are perfect for birthday parties! thanks a lot.